The marketing push for Aquaman is in full swim (see what I did there). Last week brought a first TV spot for the movie and now we have a batch of character posters for the movie thanks to WB. It will be very interesting to see how the promo run for this movie is handled. The December release date has always been an interesting choice for the film, one that I personally think could end up sinking the movie. Am I saying the movie will bomb? No, it will win the weekend, but it could end up winning the weekend with only around $40 million. That’s just my guess, but if my guess turns into reality, James Wan and Jason Momoa’s superhero flick could end up being considered a flop by a number standpoint. While we wait to see what tracking says before its release, WB is going to push this movie as much as they can. it’s their only DC movie this year and that means, to me alway, they’re going to throw the kitchen sink at us. Sure, we’ve only received a few things up until now, but remember that Thanksgiving is right around the corner. Not only is the NFL huge on Thanksgiving, but Tiger Woods and Phil Mickelson are having their one-on-one match that weekend as well. If WB is smart, they will put all their marbles in those two days. The amount of eyes that will be glued to the TV is outrageous, and not taking advantage of that could be a huge mistake on their part. Luckily it seems like they’re headed in that direction. They are steadily beginning to throw more at us. As for these posters, I’ll be quite honest, they’re pretty underwhelming. I understand that they can’t be perfect, posters rarely are. I just can’t help but look at these posters and think concept art or worse, fan-made. I hate saying it, but they look kind of cheesy. It’s not all of them or just one, but I cringe at the stance they’ve posed Jason Momoa in, as well as some of the background images they’ve placed. I understand giving us a badass poster, but sometimes simple is the best way to go. It’s just my opinion and my opinion alone, but I like character posters that are more like Vulko and Black Manta and not Aquaman or Mera. However, let’s be clear, these haven’t change my stance on the movie. It’s more of a “oh, that’s a bummer” situation. What do you think of these posters? Am I completely off base? Do you like what they’re going for? Which poster is your favorite and which one don’t you like as much? How have you like the trailers so far? Will it crush the box-office opening weekend? Sound off on everything in the comments! 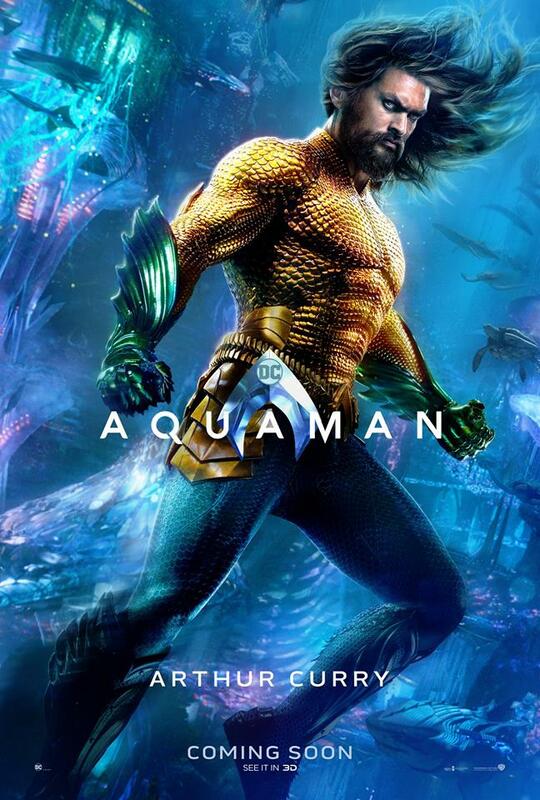 Also starring Amber Heard, Patrick Wilson, Willem Dafoe, Dolph Lundgren, Yahya Abdul-Mateen II, Ludi Lin, Temuera Morrison and Nicole Kidman, Wan’s Aquaman swims into theaters on December 21st. Diego Luna Will Reprise His Role as Cassian Andor In Another ‘Star Wars’ Series for Disney’s Streaming Service!